In stock -This product will ship today if ordered within the next 10 hours and 21 minutes. 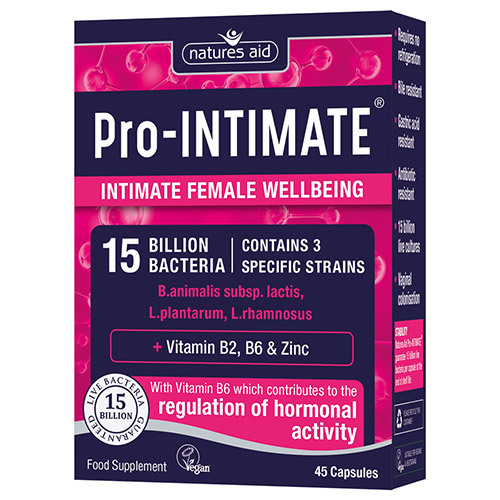 Natures Aid Pro-INTIMATE is a daily complex containing 3 extensively researched strains of bacteria; B. animalis subsp. lactis, L. plantarum and L. rhamnosus providing 15 billion live bacteria per capsule. 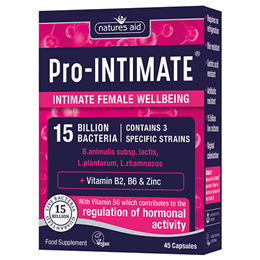 Pro-INTIMATE also contains vitamin B2, B6 and zinc. Vitamin B2 aids in the reduction of tiredness and fatigue, and contributes to the maintenance of normal mucous membranes. The mucous membranes line many body cavities. Vitamin B6 helps support normal immune system function, reduces tiredness and fatigue, and contributes to the regulation of hormonal activity. Zinc helps support the normal immune system function. Pro-INTIMATE has been specially formulated by bio-chemists and nutritionists based on scientific research. Microcrystalline Cellulose, Vegetable capsule shell (Cellulose), Zinc Picolinate, Pyridoxine Hydrochloride, Bifidobacteria animalis subspecies lactis, Lactobacillus rhamnsosus, Riboflavin, Lactobacillus plantarum, Anticaking Agents (Silicon Dioxide, Vegetable Source Magnesium Stearate). Initial dose: Take 1 capsule twice a day with food for up to 3 weeks. Maintenance dose: Take 1 capsule per day with food. Suitable for use whilst taking HRT or the oral contraceptive pill. Long term intake of vitamin B6 may lead to tingling and numbness. Below are reviews of Natures Aid Pro-INTIMATE - Intimate Female Wellbeing - 45 Capsules by bodykind customers. If you have tried this product we'd love to hear what you think so please leave a review.